This is an archive of our monthly Newsletter. We encourge you to sign up to our mailing list so we can keep you up to date on the latest in our community. In the third quarter of 2013 we changed how we mailed our newsletter - Issues prior to this switch can be found here. Dr. Tom Hope MD, from UCSF's Nuclear Medicine Department will speak to the NorCal CarciNET Community on imaging and Peptide Radio Receptor Therapy (PRRT). Dr. Hope was the recipient of a 2016 NorCal CarciNET Community travel grant to attend the NANETS symposium in Jackson Hole. A patient and family discussion, facilitated by Maryellen Collamore, ASW, will follow. Light lunch provided. Click here to register. Open only to Patients and their families / caregivers. Our UCSF Meetings are held at UCSF Mission Hall 550 16th Street, San Francisco, CA 94158. 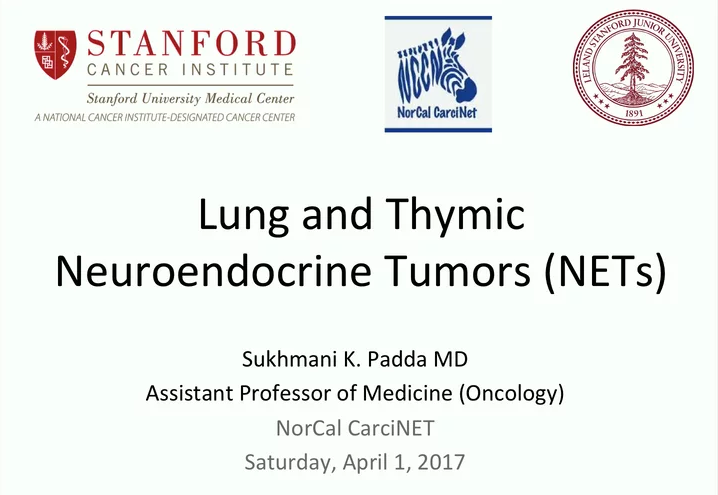 Video from our previous meeting: April 1, 2017 - Dr. Padda spoke to NorCal CariNET Community on Lung NETs. (NETRF) today announced its largest research commitment ever—$4 million in collaborative grants—most from its new Accelerator Grants program to study neuroendocrine tumors (NETs), a widely misunderstood, commonly misdiagnosed cancer type, without adequately identified genomic drivers. Accelerator Grants recognize innovative and transformative research of NET drivers, capable of expanding our understanding of the disease and informing personalized treatment options. They are funded as part of a $15 million gift to NETRF by the Margie and Robert E. Petersen Foundation. To read more and/or to view presentations from the grant presentations, click here. JAMA Oncology published "Trends in the Incidence, Prevalence, and Survival Outcomes in Patients With Neuroendocrine Tumors in the United States" updating incidence and prevalence from 2008 study. The article shows an increase in both incidence and prevalence of NETS due to increased diagnosis of early-stage tumors. Survival of patients with distant-stage tumors has improved, reflecting improvements in therapies. According to the study as of 2012 there are ~171,000 people living with NETS in the US with ~23,000 new cases per year. Click here to view the article on line or click here to download the article. Pancreas published "Patient-Reported Experience of Diagnosis, Management, and Burden of Neuroendocrine Tumors: Results From a Large Patient Survey in the United States" The survey showed that approximately 50% of US patients reported being diagnosed with other conditions before receiving their NET diagnosis, which for 34% took 5 years or more. Patients experienced many symptoms on a daily basis as a result of NETs, which had a substantial negative impact on their work and daily lives. Numerous improvements were suggested by patients, including better access to NET-specific treatments and medical teams/centers and better education for the management of disease-related and treatment-related symptoms. To read the entire article click here. 2015 was an eventful year for the NorCal CarciNet Community and the NET Community as a whole. In just the last few months exciting developments have taken place that will impact our community as we go forward in 2016. Three Phase III NET trials reported positive results - We will feature presentations on all three at the 2016 Bay Area Neuroendocrine Patient Conference on January 24, 2016. Click here for more information and to register (there is no charge). University of Iowa received a $10 million grant to study NETs from the National Cancer Institute. Ga68 imaging for NETs is closer to approval, as the first New Drug Application was submitted. NorCal CarciNET's President was honored as the 2015 Warner Advocacy Award Recipient. NorCal CarciNET Community is a 501(c)(3) whose board members volunteer their time and energy so that all donations can be put to use to support our Community's Mission to "help those with neuroendocrine tumors and carcinoid to share challenges and experiences, learn about prognosis and treatments, find information, and improve communications between the medical community, patients and caregivers." We look forward to welcoming Dr. Thomas Hope from UCSF. Dr. Hope’s main research focus is on novel imaging agents. He is the lead investigator on the Ga-68 DOTA-TOC IND at UCSF. We look forward to seeing you at our October 3rd meeting. Our meetings are held from 1-4pm at the Cancer Support Community (CSC), located at 3276 Mc Nutt Avenue, Walnut Creek, CA. For more information visit our meeting page online. Earlier today, NorCal CarciNET's Josh Mailman was named the 2015 Warner Advocacy Award recipient for Excellence in NET Patient Advocacy. Josh will be presented with the award on January 24th at the 2016 Bay Area Neuroendocrine Tumor Patient Conference in San Francisco (see below). To read more about the award please click here. On June 30th, Dr. Edda Gomez-Panzani, a dear friend of NorCal CarciNET passed away from cancer. Edda gave several talks to our group over the years and was very supportive not only to our support community but to many support groups across the world. Edda was instrumental in the recent FDA approval for lanreotide late last year. To celebrate her life, we have put up a remembrance page on our web site. Please feel free to add your thoughts to the page.